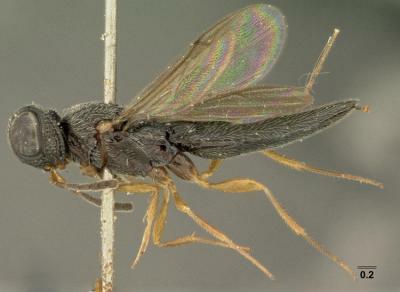 A new study greatly expands knowledge of the wasp genus Oxyscelio. A total of 90 species are recognized from the Indo-Malayan and Palearctic realms of Asia, 71 of which are described here as new species. A total of 438 photographs are included to aid in specimen identification, all exported to and available for the public from EOL. Newly discovered species are described from a range of countries including Brunei, China, Christmas Island, India, Indonesia, Japan, Laos, Malaysia, Nepal, The Philippines, Singapore, South Korea, Sri Lanka, Taiwan, Thailand, and Vietnam, while previous knowledge of the genus was confined only to The Philippines, Sri Lanka, and Australia. The study was published in the open access journal Zookeys. Oxyscelio was first recognized as a distinct taxon in 1907, from a specimen collected in Java, Indonesia. The genus belongs to a wasp family that is represented mainly by parasitoid species. These are organisms that exhibit in essence parasitic behaviour, but unlike normal parasites they go further in sterilizing or killing the host, and sometimes even consuming it. The wasps from the Oxyscelio group presumably parasitise on the eggs of another insect. Previous researchers Jean Jacqués Kieffer and Alan P. Dodd continued to describe new species until 1931. Oxyscelio received almost no attention from that time until 1976, when Lubomír Masner, one of the authors of this study, published revisionary notes for genera of the then-recognized family Scelionidae. This resulted in a total of 19 species known from Asia. Extensive specimen collecting in the following decades revealed that the actual number of species of Oxyscelio was much greater than previously recognized. The U.S. National Science Foundation (NSF) initiated Planetary Biodiversity Inventories (PBIs) to facilitate description of species that were known to a handful of scientific specialists but not yet officially published. Part of that initiative enabled the current study, which resulted from examination of thousands of preserved Oxyscelio specimens that had been housed in natural history collections around the world. This resulted in a more than fourfold increase in the number of species of Oxyscelio that are officially described from Asia. Previously described species were examined to ensure that newly described species were distinct from them. This required the rediscovery of several species that had not been seen in a century or more, including the first described species of Oxyscelio, which had not been seen since its discovery in 1907. New technology enabled better examination of the morphology of these species, which had not even been photographed until the publication of this study. 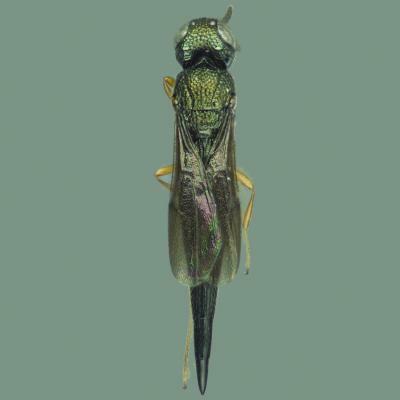 This image shows Oxyscelio foveatus a species already known to science but redescribed and illustrated in the paper.